The Standard Security Blyth and Wansbeck Sunday League got back under way at the weekend with a number of cup games. In the SA Randolph Cup, Ashington RAOB beat visitors Blyth Town Sunday 5-2 with goals from Reece Simpson (2), Kyle Oliver (2) and Paul Dunn. 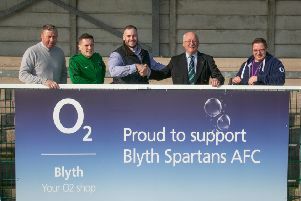 Peter Roberts and Jordan Miller scored for Blyth. In round one of the JD Marnock Cup, Ashington Station Lounge progressed to the second round with an 8-1 win over Ashington Sporting Club. Richard Stobbart (5), Paul Keys, Daniel Donnelly and Kieran Parkes were the men on target with Robert Watt scoring Sporting Club’s consolation. Also through to the second round are Bedlington Market Tavern who won 5-0 at Bebside Inn with goals from Jonny Barrett (2), Brad Richardson, Calum Donohoe and Daniel Dargue. Whitehouse Ashington also went through with a 6-0 win at Guide Post Shakespeare Tavern. Michael Freathy (3), Michael Grieves, Jordan Lashley and Mark Taylor did the damage. In the quarter-final of the Alan Davison Cup, Bedlington Social Club progressed to the semis with an 8-5 win over Broomhill North End Trap. Goals for Bedlington side came from Adam Ryder (2), Craig Webb (2), Adam Harvey, Brad Jones, Joe Moscrop and Andrew Welsh. Gary McDonald and Jonathan Graham scored two each for Trap. Amble closed the gap in the premier division with an 11-0 win over Ashington Town Central with Josh Hay (3), Liam Brookes (3), Sean Taylor (2), Joe Henderson, Ross Straughan and Lewis Shanks the men on target. Division one saw High Street take the points at home with a 4-2 win against North Shields Pineapple. Goals for Street came from James Armstrong (2), Adam Emmerson and Anthony Goldie. Jay Miller scored both for Pineapple.